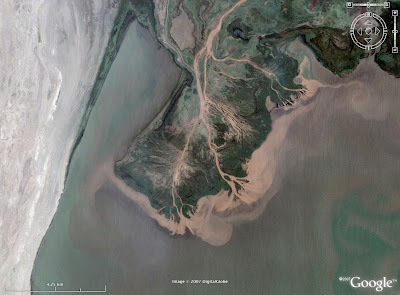 After the big bend of the Irrawaddy River around an anticline in northern Burma (at T. rex eats fish), here is another Google Earth challenge, following in the tradition of a previous WoGE posted on Hindered Settling. Schott rule in effect. Post time: 12:05 pm CST, 11/23/2007. Well done! Apparently there are some interesting differences between Google Maps images at different zoom levels in the area (suggesting changing lake level and therefore changing delta morphology). Will get back to this later. The second KMZ link works for me, the first one doesn't.